Full Speed USB 2.0. 48 Inputs, 96 outputs. Upgradeable Firmware. Trackball and spinner simply plug in. RGB LEDs simply plug in (Ultimarc Ultralux or ClassicRGB). This board has a total of 176 connections. 48 inputs each with it's own dedicated microprocessor pin. No interaction or delays, vital for multi-button games such as fighting games. Emulates a USB keyboard and yet breaks through the USB simultaneously-pressed-switch limit of 6 switches (plus ctrl,alt,shift) which afflicts all USB keyboard devices. This is because it has inbuilt full native USB support, and does not rely on an add-on adaptor. Also emulates Mouse, Game Controller and Power/Volume Control. All input pins can be assigned to any keyboard key, gamepad button (including hat switch), mouse button or power/volume control. Also sleep/wake. 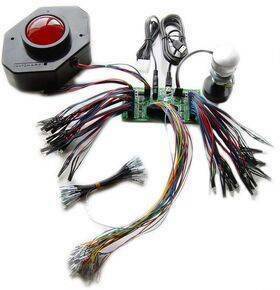 Inputs can be assigned as trackball and spinner and our U-Trak and SpinTrak devices plug directly into the board. Shift function which allows ANY input to be assigned to a shifted secondary keycode and the shift button can have it's own function too so no need for a dedicated extra control panel button. Self-test LED which gives an instant visible check of your installation. 96 channel LED controller with constand-current drivers. Also 8 high-current 1 amp drivers. Brand new INTERACTIVE configuration utility which applies and reads back any changes "on the fly". I-PAC Ultimate I/O retains it's programming after power off. Beware! Not all keyboard encoders do this! Special version available with ACCELEROMETER chip on board which is configured for "nudge detect" mode. 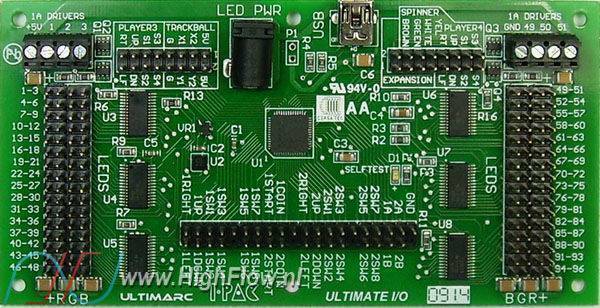 The I-PAC series (Interface for Pc to Arcade Controls) are boards which allow connection of arcade controls such as buttons and joysticks to a USB port on a PC motherboard. They are designed around the MAME emulator which supports over 1000 arcade games and can be used with other emulators. It is designed to be used inside an Arcade Games cabinet with the PC motherboard also mounted inside, but could just as easily be used with simply a control panel without a cabinet. Special shift function buttons mean that a normal keyboard is only be needed for game loading and configuration, not for gameplay. All key codes can be programmed but you dont have to as you can use the built-in default configuration which has all standard MAME codes for quick and easy installation. Programmed keys codes are stored even after power off. Fully programmable key code set. Stored even after power off unlike some other interfaces which lose all data when powered off. Controls can be assigned to any keycode, gamepad button, plus mouse buttons, power, volume up/down, sleep or wake. Wiring harness supplied for 32 input connections. Additional harness options for the other 16 inputs. Connections marked on the board. Trackball and spinner interface. When enabled these use a total of 6 of the available 48 inputs. Example configurations include: 2 player with trackball/spinner. 4 player without trackball/spinner. Self-Test LED gives an instant check of all your wiring. Can indicate which, if any, input has a problem. All button inputs referenced to ground - no need to re-wire separate grounds to each button. Supplied USB cable plugs into PC USB port. Using host software, an unlimited number of keycode configurations can be stored and downloaded on-the-fly. Retained on power off. No separate power needed for controls. Does not use a matrix - no ghost keys. Does not use a scanning method which causes a variable delay. Each input has it's own dedicated connection into the on-board CPU . Fast running interrupt-driven software gives much better response than a standard keyboard controller. Key debounce uses a state method for each key. No delays between keys depressed at the same time. (essential for fighting games). 2 operation modes. Either uses standard MAME keys or you can program your own character set. Shift functions. Holding "Start1" and pressing other buttons sends a range of codes for MAME functions such as "escape", "Coin 1", "tab", "enter". This means no extra buttons are needed on the cabinet. In programmable mode any input can be the shift key and all keys can be programmed with a shifted code. Special note for Windows MAME users! Shift key functions mean you can select and start games from the Windows interface without using the keyboard or mouse. No special drivers needed. USB drivers are generic Windows. Fully compatible with all Apple Mac (excl config utility). Supports the Apple Mac "command" key and the Windows "GUI" keys. 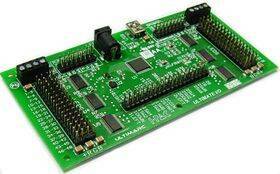 Special board version available with Accelerometer on board. When enabled this sends "arrow" keys, responding to physical movement. Supplied configuration utility allows customisation and storage of attract-mode LED sequence. Comes with power cable for plugging into a PC disk drive power connector. Compact modular connectivity. Our Ultralux RGB and ClassicRGB pushbuttons simply plug in. Other harnesses and connectors available.